Includes 1 Year EverythingMusic Extended Warranty Free. The EQP-WA is a re-creation of the most renowned tube Equalizer in studio history, the "Pultec EQP-1A". Not only does the look and feel of the EQP-WA match the classic Pultec units, but the sonic quality has been carefully considered by using top-end components such as CineMag transformers and premium tubes. This fully discrete Tube EQ can pull euphoric sonics from any track and bring a brilliance and lustre to mixes that's nearly impossible to achieve inside-the-box. 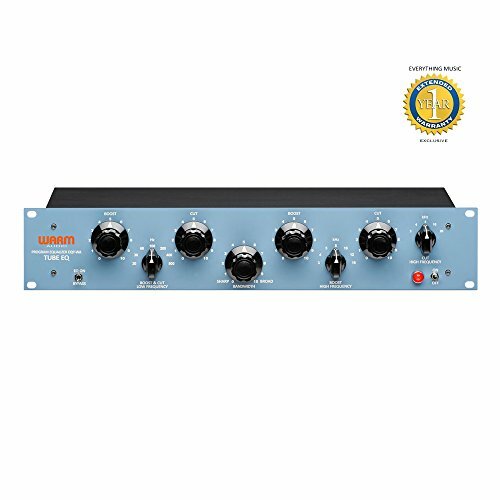 We are proud to have once again redefined the industry standard by bringing a fully professional-grade equalizer to the market at a price that's just as remarkable as the unit. Tube Equalizer based on the classic "Pultec" EQP-1A. If you have any questions about this product by Warm Audio, contact us by completing and submitting the form below. If you are looking for a specif part number, please include it with your message.